The year was 2055 AD. The planet Earth had become increasingly inhospitable over the last forty years. Leaders of nations had held summit after summit trying to come to an agreement regarding the steps to be taken to curb global warming. Statesmen had bickered and bartered but no agreement had been reached. Finally, in the year 2040 AD, the Ozone layer covering the earth had burst wide open. The harmful radiation from the Sun had attacked the earth and had caused irreparable damage to the earth’s atmosphere. The result had been devastating. Insects had mutated. Mosquitoes had grown ten-fold in size bringing in newer strains of Malaria. Plants had shriveled. Acid rain was an everyday occurrence. Diseases had spread. Huge tsunamis had struck the coastal areas of earth killing millions. Several species of new organisms with destructive characteristics had come into existence. The very topography of the earth had changed, and newer unknown diseases with no cure continued to spread. Life on earth was not expected to survive beyond the next fifteen years. Death continued to strike everywhere. Animals died, plants wilted, and millions of human beings perished over the years. Finally, in the year 2047 AD Russia and the USA independently started research projects to locate a new planet in the universe for human beings to colonize and inhabit. It goes to show something of the nature of human beings that even in this last-ditch effort to survive, statesmen could not see eye to eye and decided to launch their own independent projects instead of a joint effort at survival. They competed with each other in being the first to evacuate their people to a habitable planet. Both countries were extremely secretive about their progress in the venture. Finally, the Americans seemed to have come up with the first breakthrough in the year 2054 AD. The Americans selected astronaut Adam Hertford as commander of the specially designed US spaceship Kennedy Habitable Planet Finder I and sent him alone into space on the mission to find a planet to colonize. They could not afford to lose astronauts. Adam had roamed the universe in his spaceship for a long time. He was in a desperate hurry. If he failed in his quest humankind would soon become extinct. After twelve months of roaming the universe, Adam had finally located a planet at a distance of ten billion light years away from earth. The planet had appeared blue in color. This had given Adam some hope that the planet might contain some water. After surveying the planet for two hours he finally decided to land. At 12.30 PM earth time, he skilfully inverted his spacecraft and brought it to rest gently on the surface of the planet. He put the retractable ladder in position, donned his space suit and checked the oxygen levels of the containers attached to his spacesuit. He pressed the switch to open the front door of his spaceship. He waited with bated breath as the front door swung open slowly. He first lowered the Oxygenometer tied to an unbreakable steel cable to the surface of the planet. He had to use the Oxygenometer to test the Oxygen levels of the planet’s atmosphere. After lowering the equipment, he climbed down himself. But before he could set up and prepare the Oxygenometer for testing, he glanced around briefly. And suddenly he got the shock of his life. At a distance of two hundred yards, he saw the most beautiful woman he had ever seen in his life. She was walking towards him. She had lovely sharp features and a beautiful figure. She was blonde haired and blue eyed. She was wearing a beautiful pink skirt and a white top. Adam stood dumbfounded and waited. ‘I am Commander Eve Sokolowski from the Russian Planet Finder Serova III. I landed here an hour back a little distance away,’ she replied. ‘Have you contacted earth?’ Adam asked tersely. Suddenly Adam stripped off his space suit. He looked deep into Eve’s eyes. Something jumped in him. They rushed into each other’s arms and kissed passionately. 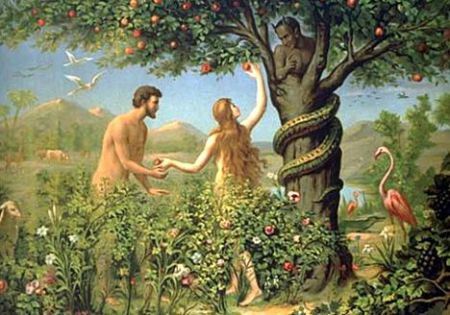 The second edition of the Adam and Eve story from the Bible had just begun. oh wow... I loved it..!! great conceptualization.